Created by American pharmacist Wilbur Scoville, the scale is based on the Scoville Organoleptic Test that measures capsinoids (heat components of a pepper) according to 5 trained testers. Of course, given the subjectiveness of human tastebuds, the scale is not precise each time. For scale, the Bhut jolokia pepper from Northeast India is over one million Scoville units, and is considered the spiciest chili pepper in the world. 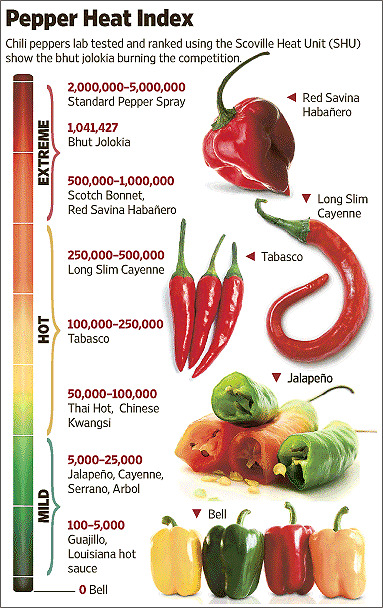 The bell pepper (capsicum) on the other hand is at zero Scoville units, with no pungency at all. Cool pop trivia info, right?